The apartment offers free Wi-Fi, air/con. and full Sky package TV. It is airy modern and bright and is approached from street level with no steps or lifts making it easily accessible for people with heavy luggage or golfers with equipment. There is an excellent swimming pool set within a garden environment plus a lovely separate area with paddling pool for younger children and within yards of the apartment a children's play area next to an outside café, offering snacks and drinks. Surrounded by a selection of bars and restaurants to suit most pockets and tastes, there is an excellent large supermarket 'Mercadona' within approximately a 2 minutes walk and the local beaches are no more than a few minutes walk away. There is no need of a car as there is a taxi rank and a local bus service situated opposite to the apartment, which runs into Benalmadena, up to Tivoli world, the Cable car and the bustling town of Arroyo del Miel where the leisure centre and ice rink are housed and is the only one on the Costa del sol. There are also other bus routes within easy reach which will take you into all the major towns and attractions no more than a 10/15 minute journey away. There are also two excellent water parks close by, Tivoli World and the cable car which can be reached by the local bus. We live in the west country and run a Bed & Breakfast nr to Cheddar. Because of our love of Spain and the fact that we have quite a few family members living out there, it was for this reason we decided to buy our apartment, as it was close enough to get together but also so we could be independent as well. Immediately we saw the apartment, we felt it was right for us it was spacious, had a separate kitchen two bedrooms and bathrooms and lovely views of the Med and mountains from the spacious terrace. There is a very pretty walkway made to look like a white washed village leading to the excellent swimming pool and children's paddling pool. Close to an excellent golf club and there is a large well stocked supermarket literally two minutes away. You are within easy walking distance of a variety of restaurants, bars and some shops. There is no need of a car as there is a taxi rank and a local bus stop only yards from the apartment. Another reason we chose this area although it has everything you need on your doorstep, several shops, transport etc. it is ideal for families as it is set within a quieter environment but close to all the local towns and attractions but without all the noise. There is a lovely fully fitted bathroom consisting of a bath, shower, bidet and WC with marbled flooring and walls and a second spacious shower room with large shower cubicle powerful shower, basin, shelving and WC also with marble floor and walls. We offer free Wi-Fi with fibre optics free air/con. Free Sky package TV. We do provide towels and tea towels but not beach towels, where the guest must provide there own. The lounge/diner is attractively furnished with a 2 seater settee, 3 seater sofa bed, 40" flat screen TV and DVD. The dining area seats up to 6 with patio doors leading to the large terrace with glass curtains and stunning views of the sea and mountains. There is an excellent fully equipped separate kitchen with a top of the range oven and hob with extractor fan, large fridge freezer, microwave, dishwasher and washing machine. there is a very comprehensive range of pots, pans and utensils. Sky TV available free, offering films, box sets, Sky sports. There is a shared garden down by the pool with grassed and shaded areas and we provide sun loungers to take down to the pool during your stay. There is a lovely spacious terrace/balcony overlooking the Med to the left and Mountains to the right. patio furniture for up to 6 and a Spanish Style Stone BBQ which is ideal for outside dining. The apartment is approximately 2 and half hours away from the famous Sierra Nevada mountains, where you can spend the day ski-ing and snow boarding, take a trip in a 'Huskie Sleigh' or just enjoy a trip in the cable car right up to the chalet style restaurant at the top of the mountain and still have time to return to the sun in the Costa del Sol the same day. There are tennis courts close by. The apartment is within a short distance of the famous Torrequebrada Golf club and next door to the course, which has stunning views of both the sea, mountains and course,the Spanish open has been played here as well. Non residents are welcome and it is a lovely place to enjoy a coffee, something a little stronger or a light lunch while enjoying the fabulous views the club has to offer. The area is served with several other excellent clubs which are all within a short distance by car. The apartment is suitable for some people with disabilities as we have had several who have stayed there. It is situated on ground level so there is no stairs to access, For any guest who cannot walk far there is a taxi rank & bus within yards of the apartment and a large supermarket close by. However the apartment has not been adapted for people with severe disabilities or handicaps and we would suggest in these cases they may wish to look for something which has been adapted to their needs. Notes on accommodation: We have air conditioning and central heating which are free and double glazing which keeps the apartment cool in summer and warm in winter there are also glass curtains on the terrace which can be used during the autumn/winter months creating another room which allows you to enjoy using the terrace even on cooler evenings. There is free Wi-Fi with fibre optics. We can offer cots, a highchair, potty and buggy We also have a very comprehensive library of family, children and adventure DVD's and the option to upgrade to sky. We have recliner chairs and a parasol which can be used on the terrace as well as down by the swimming and paddling pools. The pools are set within a lovely garden environment with grassed and shaded areas as well as a changing area and toilets. The apartment is within yards of a lovely children's play area, café and large comprehensive supermarket, local bus service and taxi rank and within easy walking distance of bars, restaurants and local beaches. Outside: The apartment has a large terrace decorated with colourful Spanish ceramica with stunning sea and mountain views as well as views of the palm tree lined road leading down to the beach, restaurants, cafes, bars and supermarket, Included on the terrace is a stone built Spanish style BBQ if you feel like some 'Al Fresco' dining, a patio set for six and several recliner and lounger chairs as well as a parasol, which can also be used down by the swimming and paddling pools, so you can relax and enjoy the glorious weather. There is a lovely walkway which can also be viewed from the terrace which resembles a little white washed village and areas with seating and lighting which look like small village squares, this leads down to the swimming and paddling pools which are housed in a garden environment with grassed and shaded areas with attractive plants and palm trees. The pool is a very good size possibly one of the largest in the area. Cleaning / Towels / Linen / Maid service: Towels, linen and tea towels are included during your stay and the apartment is cleaned after each let. However if you would like the apartment to be cleaned during your stay this can be arranged. Please let us know if you would like this service. Good accommodation. Within 10 minutes walk from several good restaurants, though a bit of a hill to reach them. There were 4 of us on a golfing trip and sofa bed in lounge gave plenty of sleeping accommodation. Would book again. We would highly recommend this property. My husband, 2 boys and I had 14 fabulous days in it. It is exactly as described as is the area . Gilly was so helpful before the trip and provided a hugely comprehensive guide to the apartment , area, things to do etc. It was home away from home as everything was thought of to ensure a great stay. The apartment and its contents are of a very high standard and it is clear that Gilly and her family take great pride in their apartment ensuring its comfort for all their visitors. The multi channel tv and dvd bank were super as the boys love watching sport and movies. Gary and Helen were also very helpful on site as we had a couple of little queries. 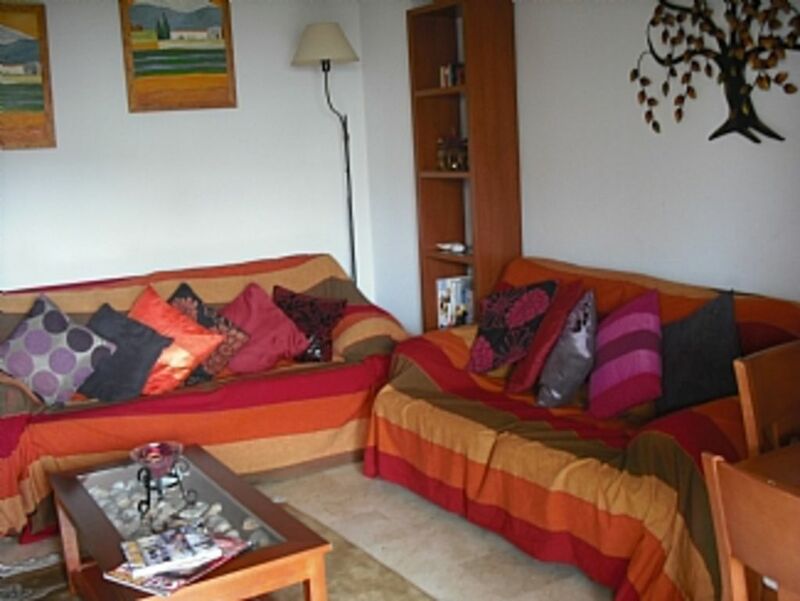 Its location in Torrequebrada is really only a 5 min bus trip to Benalmedina and we were easily able to access all areas with the comprehensive and very cheap bus service and taxis.. We had a super holiday and hope to return again and to this apartment if possible. Thank you Gilly. We spent a wonderful week here at the beginning of August. Gilly, the owner, was extremely helpful before our stay - flexible with dates and sent us lots of information on the local area. The view from the balcony was simply stunning with great sea views. The communal pool was very big with lots of garden space around it. There are a choice of beaches a short walk away. Two minutes away from the apartment is a Mercadona which had everything you could possibly need. There are bars and restaurants very close by too. Our favourite was Corriander, an amazing Indian/Tex-Mex restaurant. Lovely, friendly staff and delicious food - would highly recommend it. We also loved the Malibu Beach bar with its huge sofas and great sea views, right on the beach. Definitely worth a visit. We got the bus most days into Benalmedena. A very short bus ride and the stop us five minutes walk from the apartment. There is so much to do there and lots of bars and restaurants to choose from. The apartment was perfect for us as a family as the local area was quiet and peaceful but the hustle and bustle of Benalmedena was five minutes away. Gary and Helen who looked after the apartment were so friendly and helpful. We had a wonderful holiday in this fantastic apartment . We spent 10 happy days in this apartment in January 2016. It has a double bedroom and a twin room, a well equipped kitchen, two fully tiled bathrooms, a comfortable lounge / diner with British TV and a library of DVDs, reversible air conditioning / heat pump throughout (pay on a meter), and a sizeable terrace with dining for six and a charcoal BBQ. The terrace has the benefit of a "glass curtain", so if it's cooler in the evening it can be closed to the outside. Views from the terrace are left to the sea and right to the sierras. There is a communal swimming pool at a lower level on the complex, but being winter we didn't try it ! Nearby facilities include a sizeable Mercadona supermarket, several local eateries and, a little further down the hill and overlooking the beach, our favourite restaurant, El Embarcadero. Further along the front by the Marina there are numerous good bars and restaurants and a children's play area. For transport we had a hire car from the company recommended by the owners, but for instance if we wanted to have a drink by the marina, dialling 0034-9524-41545 had a reasonably priced taxi pick us up from the door within five minutes. Any downside? The area is rather built up, and other than the beach and sea, if you want to see open countryside or small villages you'll have to travel by bus or car into the nearby hills. Best of all we had glorious weather - blue skies every day, with temperatures around 18 - 20 degrees, although this can't of course be guaranteed. All in all a great holiday at a reasonable cost. Lorraine B.Ballyclare, Co Antrim, UK. I personally found this apartment quite claustrophobic, too much crammed into a small space, especially the second bedroom which is closely overlooked by the higher apartments opposite. There is a table in the lounge but it is squeezed in and not possible to sit at unless pulled into the middle of the floor. The bed linen really has seen better days and we had to request new pillows, they were quite disgusting. The main bedroom is pleasant as is the balcony. The kitchen is really small - only room for one person at a time. This apartment is quite a distance from the heart of things and we spent a fortune on taxis as I was travelling with two pensioners, though there is a local bus. A bus timetable would be helpful as there was none at the bus stop. I would not recommend it for any persons with mobility issues as it is extremely hilly in every direction and even when reaching the bottom of the hill there are only a couple of bars or restaurants. It does have an excellent supermarket close by. There are also a large number of steps to get down to the beach. I therefore seem to be at odds with all other reviews! Best thing was the attention from the couple who looked after the apartment, they were brilliant, so helpful. Compared to other apartments where we have stayed I feel this was overpriced and cheaply furnished. The nearest Airport is Malaga which is approx 15 minutes by car. Car hire is not essential as there are coved beaches, several restaurants bars etc. and an excellent large supermarket all within very easy reach. There are direct bus routes & taxis within yards of the apartment taking you directly to all the local attractions. However if you want to explore the white washed villages, Gibraltar,Seville or Granada there are several places within Benalmadena where you can book a trip. Benalmadena Costa is approximately 20 minutes by foot or 2 close bus stops away as is the 5* Casino. Torremolinos, the Puerta Marina and Furengirola approximately an 8/15 min. car journey and the village of Mijas is about 20 mins by car. Marbella and Puerta Banus approx 30 mins by car. Gibraltar is about an hour and half away. Tivoli World, the cable car and the market held on a Friday at Arroyo del Miel are within approximately a 6 min car journey, as is Seaworld at the Puerta Marina. The apartment is close to several good restaurants, an open air café and bars all within easy walking distance of the apartment and all worth a visit. Asicatico yin Teppan yaki an Asian restaurant which specialises in Chinese, Japanese and Thai dishes and is highly recommended, Devines bar at (Nueva Torrequebrada) is an attractive bar which features SKY sports, pool table, light meals and has a reputation for good value and friendliness and Malibu beach bar also at Torrequebrada offers exclusive sun loungers, beach bar and restaurant and a good selection of snacks and meals, you can view these bars and restaurants on line and will give you a good idea of what the area has to offer, there are also several other good places to eat and drink close by and down by the Marina we also, as do many of our guests recommend The Wok which specializes in Asian cuisine, is excellent value and you can eat as much as you like. The Mercadona supermarket is approximately 2 minutes from the apartment and is very well stocked, with fresh meat and fish counters, toiletries and all items for the BBQ. There is a local bus stop and taxi rank opposite the apartment so no need for a car and another bus stop close by. The nearest train Stations are Torremuelle and Arroyo del Miel. All major towns such as Benalmadena which can be accessed either by foot or public transport, Arroyo del Miel a bustling and lively town, Furengirola, Torremolinos, The Marina, Malaga, Puerto Banus and Marbella are all a short distance by public transport. Booking Notes: There is £200.00 holding deposit required to secure the accommodation, however we regret that this is not refundable in the event of a cancellation. The deposit will also be used as security against any breakages, losses or damage incurred, and will be refunded only when the apartment has been vacated, keys returned and the apartment checked. Full payment needs to be sent 6 weeks before your arrival at the apartment. There is no charge for cleaning, linen or towels for up to 4 guests however we do make a small charge for additional guests and if staying for 14 days you can have the choice of additional linen or not for a small charge.. Changeover Day: We are flexible on changeover day Notes on prices: We can offer longer lets from 1st November 2014 until 1st April 2015 for a minimum of 4 weeks at a special rate of £175.00 per week. We also offer short breaks minimum of two days. If you are looking to holiday with extra family or friends other apartments close by may be available We can also offer cots, a highchair, a buggy etc., safety deposit box and Wi-Fi are available for a small cost.